"I consider this to be the greatest corn-on-the-cob recipe of all time. The way the mild, subtly salted cheese works with an ancho-lime mayonnaise, along with that buttery, smoky corn, is a magnificent combination of flavors. Perfecto!" Combine mayonnaise, lime juice, ancho chile powder, and smoked paprika in a bowl; whisk until smooth. Refrigerate until needed. Bring a large pot of salted water to a boil. Boil corn in the salted water for 5 minutes. Drain the corn. 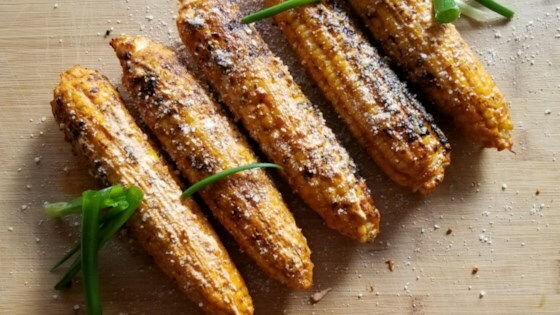 Place ears of corn on hot grill and cook until the kernels begin to brown and caramelize, 2 to 3 minutes. Turn the corn and continue to cook, turning ears after 1 to 2 minutes, until they are browned with slightly charred, caramelized spots. Generously brush corn with melted butter and ancho-lime mayonnaise until kernels are coated. Sprinkle ears with Cotija cheese and salt. Garnish with slices of lime. An amazing grilled corn topped with seasoned mayo and cojita cheese. Parmesan cheese is a common substitute for Cotija cheese, and feta will work in a pinch. I prefer a charcoal grill for the smoky taste. This is so delicious. Must use ANCHO chili powder, much milder than chili powder. This is flavorful but not spicy. I try to make my corn like this as much as possible. Yummy yummy. I don't have a bbq so I used boiled corn. I also didn't have the special cheese. This recipe was still delicious. So happy I stumbled across this. Will definitely make again.